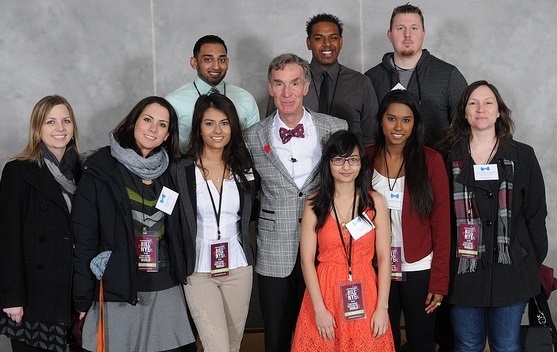 Sponsors Help Build Interest in STEM Majors and Meet Bill Nye Too! Bill Nye made a special Valentine’s Day appearance at Augsburg College to proclaim his love for science. Known to most of us for his television program Bill Nye “The Science Guy”, for which he has won 18 Emmy awards, Nye now has a day job as the CEO of The Planetary Society, the world’s largest non-governmental space interest organization. He is the author of many books for young readers, as well as the recent bestseller Undeniable: Evolution and the Science of Creation. Nye, one of the world’s most sought after speakers on the topic of climate change and the environment, was invited to campus to urge young people to pursue STEM disciplines and to use science to change the world. The event was part of Scholarship Weekend, a time when bright students from around the country visit campus to vie for the institution’s top scholarships. Saturday morning’s activities, which also included a VIP breakfast and a student research poster show, was sponsored by Beckman Coulter, Lerner Publishing, and Microsoft. In his opening address, President Paul Pribbenow thanked the sponsors for making it possible for over 700 high school students with an interest in the STEM fields to visit campus and attend Nye’s keynote presentation. The total attendance for the sold-out event was nearly 2,000. Thanks to Beckman Coulter, Lerner Publishing, and Microsoft for being a part of this amazing event! Click here to WCCO (CBS) coverage of the event.